It’s difficult to picture a scene more quintessentially London than black cabs and Routemasters crossing the River Thames at Westminster Bridge, with the Houses of Parliament on one side and the London Eye on the other. These are the kind of views you can expect to enjoy when buying or renting a riverside property in central London. 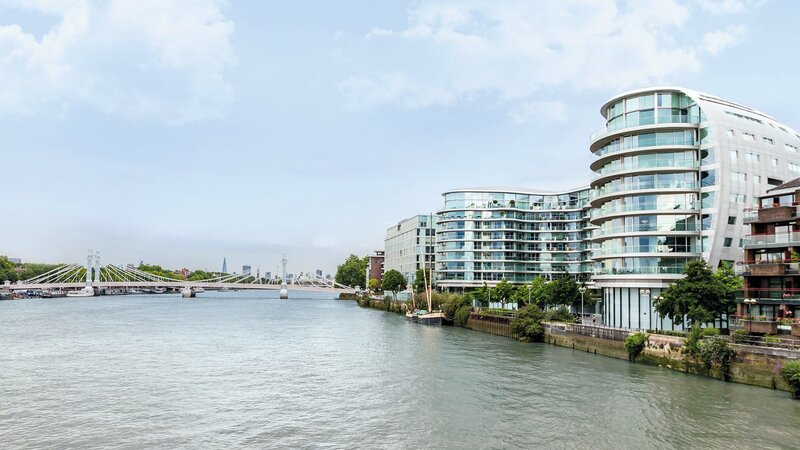 With offices in Battersea, Chelsea, City, Covent Garden, London Bridge, Pimlico, Vauxhall, and Westminster, Waterview sells and lets properties in London’s most iconic riverside locations. The river is the lifeblood of the city, and here it runs past the finest walks London has to offer, the best central locations and some of the most desired homes on the global property market; residents of penthouses here can expect panoramic views across the capital. Battersea’s regeneration offers a new age of riverside living, Georgian and Victorian terraces and luxury apartments alike overlook the Thames in Chelsea and Pimlico, and, moving east, the South Bank continues to attract residents and tourists with its many restaurants, events and festivals. With waterside pubs, bars and restaurants, cobbled streets and sleek residential enclaves, central London riverside living offers something for everyone. We regularly have a variety of riverside property for sale or to let, including flats and apartments in a number of award-winning developments. View a selection of riverside developments in central London. Across from Battersea marks the point where Fulham becomes Chelsea. Chelsea Harbour is home to luxurious modern apartments and yachts bobbing in the marina and is known for the 250ft Belvedere Tower which is topped by a tide ball. Albert Bridge is arguably the most beautiful bridge on the Thames, and joins Chelsea with Battersea. Chelsea is one of the best known residential areas in the UK, if not the world. The beautiful garden squares, elegant townhouses and the period conversion apartments are particularly sought after. Chelsea residents are passionate about their area and maintaining the Chelsea way of life. The most sought after riverside properties here can be found on Cheyne Walk. Dominated by the Houses of Parliament and Westminster Abbey, the surrounding historic enclave of Westminster contains some exquisite Georgian terraces, including Barton Street and Lord North Street. The view of London from Westminster Bridge is iconic, as demonstrated by the hordes of tourists one must wade through to cross it. The bridge was designed in a style to complement the Houses of Parliament, as was Lambeth Bridge; Westminster Bridge is painted green to match the green leather of the benches in the Commons, whilst Lambeth Bridge is painted red to match those in the House of Lords. In recent years, luxurious residential developments have sprung up in Westminster, interspersed by Burberry’s prestigious headquarters and the iconic Channel Four building. Your day-to-day needs are provided for here, with supermarkets, dry-cleaners, gyms, cafes and restaurants virtually on your doorstep, whilst the fashionable delights of Mayfair and the West End are just a brief taxi ride away. The imposing County Hall sits here, incorporating the London Aquarium and beside the London Eye, one of the tallest structures in London. Royal Festival Hall, London's leading classical music venue located at the heart of Southbank Centre, was the first post-war building in England to be Grade I Listed. Thanks to its location on a bend on the River Thames, the views from Waterloo Bridge are some of the finest in London. One of the most exciting areas in London to live, with riverside bars and restaurants, Borough High Street, the Shard and Borough Market, as well as historic buildings such as the Globe, Southwark Cathedral and the Clink nearby, London Bridge is an incredibly popular place to live. It is home to many blue chip companies, allowing people to live, work and play all in one area.